Citizens' groups are using multiple levers to promote justice, sustainability and accountability in investment processes. These range from grassroots action to claim rights, engage in legal reforms and international policy debates, to mobilising international human rights bodies. It also includes making use of investor and company grievance mechanisms to scrutinising international investment treaties, contracts and arbitration. 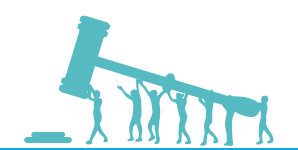 Through approaches such as legal literacy trainings, paralegal programmes, radio broadcasts or local deliberation tools, civil society organisations are enabling communities to register collective landholdings, claim their rights and to have a say in investments that affect their lives. There is a need to share lessons from this experience – both the successes and the challenges still to be overcome. And in a carbon-constrained and time-pressured world, practitioners need new ways to communicate, interact and learn from one another without necessarily travelling the world to resource-intensive meetings. To facilitate international lesson-sharing, IIED and its partners use multiple interlinked channels, including international workshops, webinars, practitioner write-ups and newsletters. Striking down adverse investment laws: Success stories from Indonesia, 25 March 2014. The practitioner write-ups provide an opportunity to reflect on innovative experiences, and to share lessons with a wider community of practitioners who may be grappling with similar issues elsewhere, or may be inspired to take action.